Now that Citrix and VMware found their cloud mates I was wondering what that would do with the costs. As there is not that much to play with I decided to work with the cost calculators from both Microsoft and Amazon to see what the difference would be. Microsoft Azure offers a calculator to deploy a Citrix environment so I used that one, you can find that one here – link -. Amazon doesn’t seem to have a Citrix calculator nor is there a VMware calculator active right now. Ideally I would like to compare apples with apples but as only Amazon offers the ability to choose a Workspace variant ( their VDI deployment) and Microsoft offers a variant where you pick an server-based solution so an SBC environment. As this was not apples versus apples I decided to do it differently. 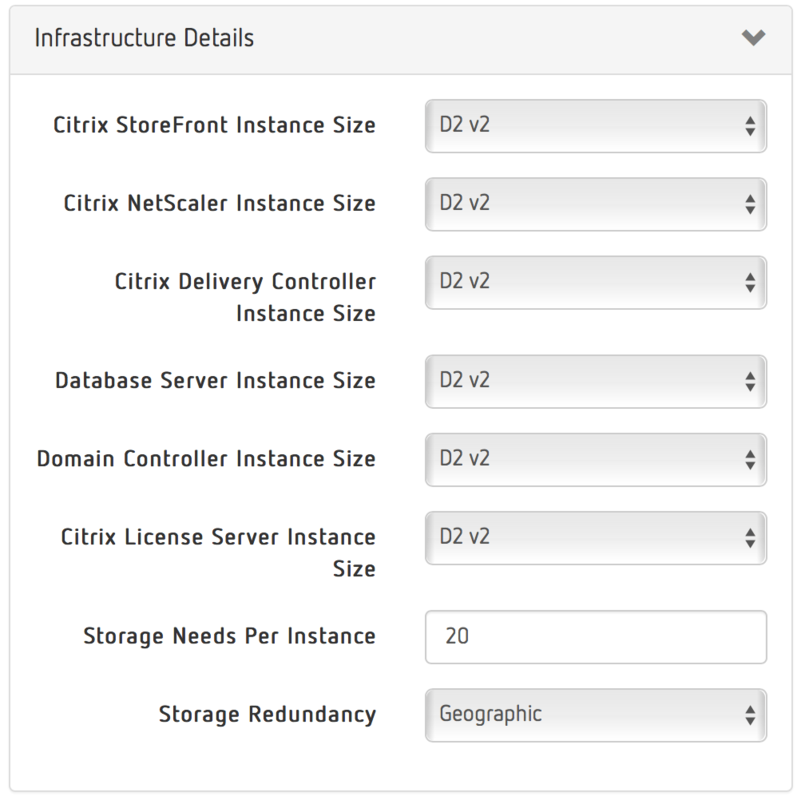 Amazon is offering different deployments solutions so if you look at their S3 offering you can pick the servers for deployment and setup the environment like you want. So I looked at what Microsoft with Azure was offering and picked the same servers and sizing at Amazon WS EC2 to see what the price difference would be. Perhaps still not the same apples but it comes closer. The minute I can pick the same solution on both sides I’ll do a repost. so let’s stat with Microsoft Azure my starting point in this. So my goal is not the find the winner, who is cheapest… just to show you there is much to pick and that will change the monthly pricing. Also as you know what a cloud development costs you know whether or not it is interesting for you. So this first part is about Microsoft Azure, the next part will be about Amazon WS. So Microsoft Azure has released a cost calculator to deploy Citrix in the Azure cloud. You can find it at – link – as also mentioned earlier. The first thing to do in Microsoft Azure is to pick your zones, where is your environment running. This can be more than one location. I seems that Europe is more expensive than the US, but we don’t want our data in the US so let’s pick Europe west. As you see there are two options in blue directly under the region you select. There is a “Smart Scale” option and a “Primary zone” option. The later one is clear but the first one is important to take in consideration. If you want your environment up and running 24/7 it will costs you more. if you select smart scale they will automatically scale your environment depending on the user load. you can set the time, as you will see later on, that the environment has to be available. So I left the settings like that for now, the next setting is ” High availability configuration”. 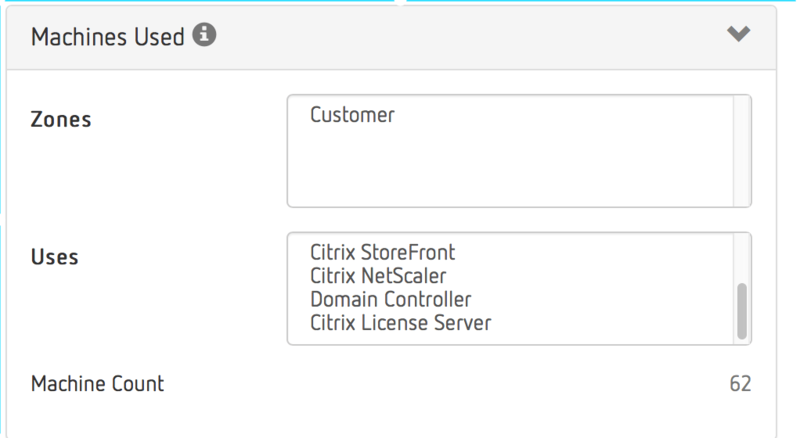 by default this one is off and I can’t think of any reason why.. who deploys a Citrix environment without HA? so I switched it on. The green options are whether you want the components deployed for you. You can deselect some of them but not all of them. They all are needed somehow, if for instance you deselect the license server it will say use existing license server. So to get a working Citrix environment I selected them all. Running an environment in the cloud costs money as it does in your own datacenter. 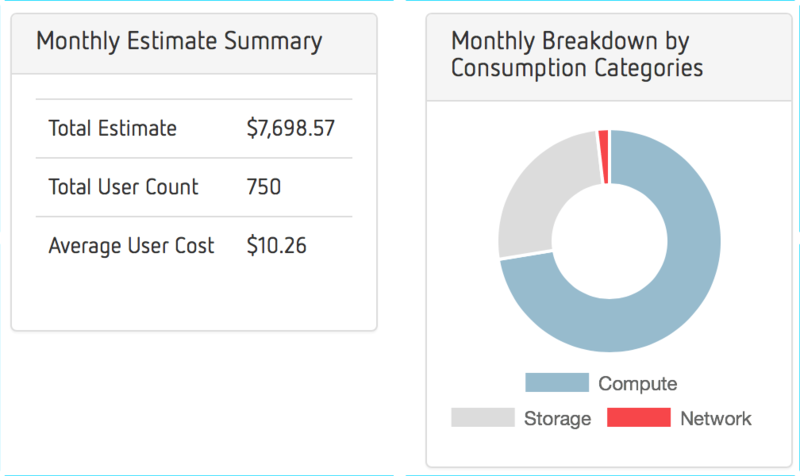 In a cloud environment the costs will be more visible as you get billed every month. On one side you want to have your environment running as users are working and on the other side you don’t want to pay more then needed. So you set the hours the environment needs to be up. So at the hour tab you set how many hours the users are working, I set this to 40 hours as this is a default workweek over here. Of course there are more hours needed for your environment to be running, that’s also why the costs are an estimate which makes cloud deployment a little dangerous. You should set it to 18 hours of so per day to make sure your users can also work during the evening. but let’s assume we can tell them to only work 8hours a day. Next stop is Workloads. So at workload you create the type of users that will be working in the environment. This is where things get a bit tricky as suddenly you need to know exactly what they will be doing. There are two difficult options to fill in, you need to know the expected IOPS and the outgoing bandwidth. Many people have done research to IOPS for centralized environment and I think 5 IOPS might be a little less for normal users. Depending on your use case this might work but we see more IOPS needed in our customer environment running on-premises. Outgoing bandwidth is a bit easier but still you need to know what people are doing, just office work of also playing video and at which resolution. Things to think about, I left it to the default and removed the taskworker at 3.5 IOPS which is a non-user for our customers… that’s the janitor never using a dekstop or app. So next up is the number of users, how many users will be working in your environment. You can mix and match here as you might have a number that work part-time. 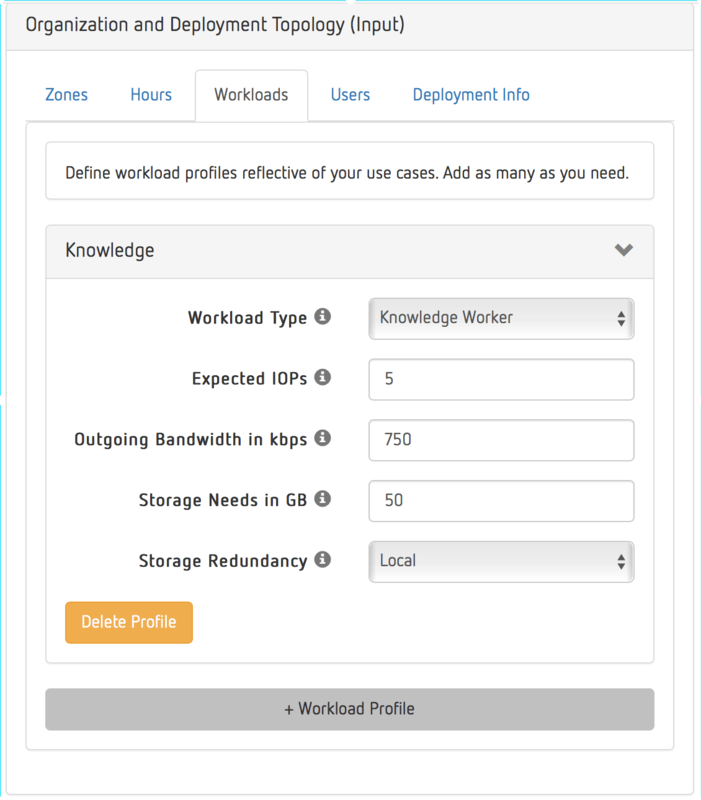 Select the zone, the hours and the workload and set the number of user for that use case. I just setup a single group of users as I think most of our customers would want it like this. The group of users not being a knowledge user to the definition of VMware, Citrix and Microsoft is small over here. So now we know the users, the workload, the zones and so on. Now let’s look at the deployment info. When we move on to the deployment info we first see the worker machine information. 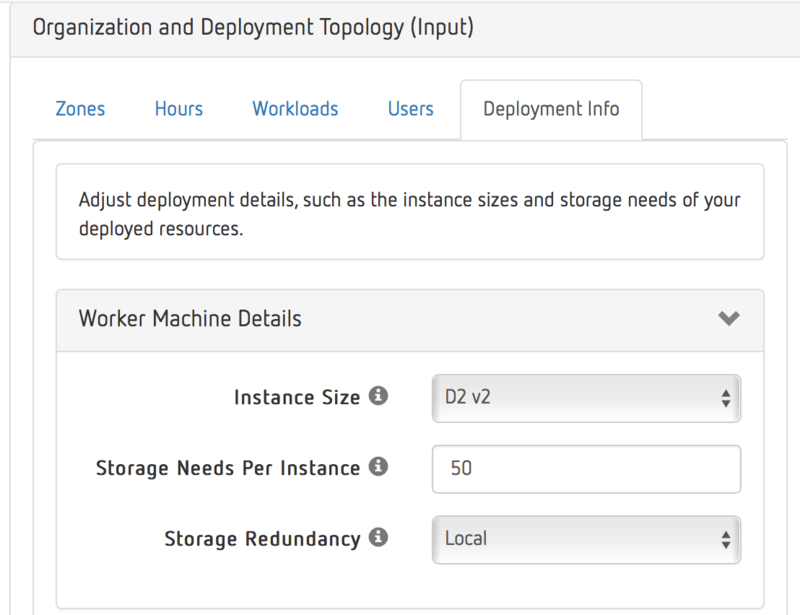 as you see the Microsoft Azure platform deploys a D2 v2 server as a worker machine. The D2 V2 machine is a 2vCPU 7GB server, it’s a small server and as you will see later on it will host about 15 users per server. Below this list is a overview of the backend servers. All these servers are also D2 v2 servers so also 2vCPU and 7GB. When I scale my environments I think 7GB with the delivery controller is just doable but only just. I think the sizing is a little on the small side. The pricing is re-calculated every time you change something, so you see what every change will do. First let me show you what is deployed, in the overview you also see the number of worker machines that they are calculating with. This is the number I used also in Amazon. So here for our 750 users working 40 hours a week and using 5IOPS being deployed in Ireland we have 62 machines. This is 50 workers machines and 12 backend machines I assume doing a little counting. This bring us to the estimate monthly costs. 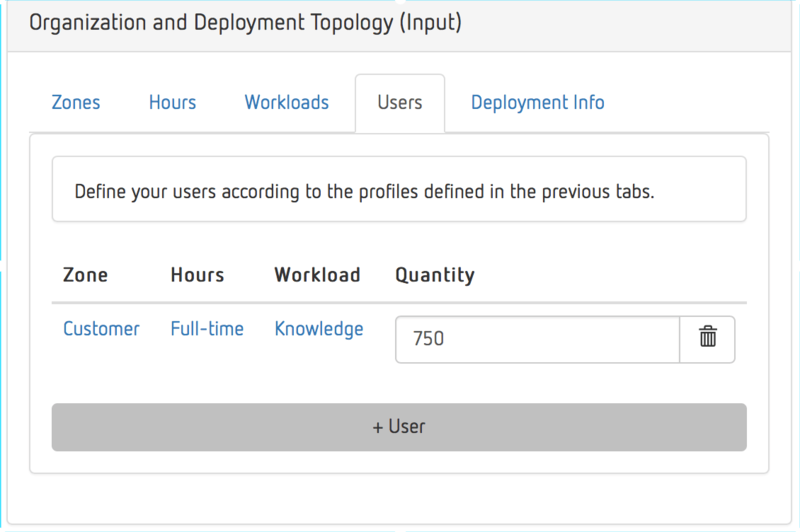 So for 7K5 you have 750 users working in the cloud, just need to add the rest and you’r good to go. This is around 100K per year in costs for running it in Azure. The costs and the model is hardware only, there is no Citrix license in this model at this moment. Citrix will present more about this cost model and the calculator at their summit conference, so stay tuned. In this first part of the blog I took a look at the Microsoft Azure deployment costs and options, in my next article I will setup the same environment in Amazon WS EC2 and see what is optional there and what the cost will be. I don’t want to judge if this is a high cost or not, going or not going to the cloud is not only costs. I played around with this and the costs can go up pretty fast depending on your choice. 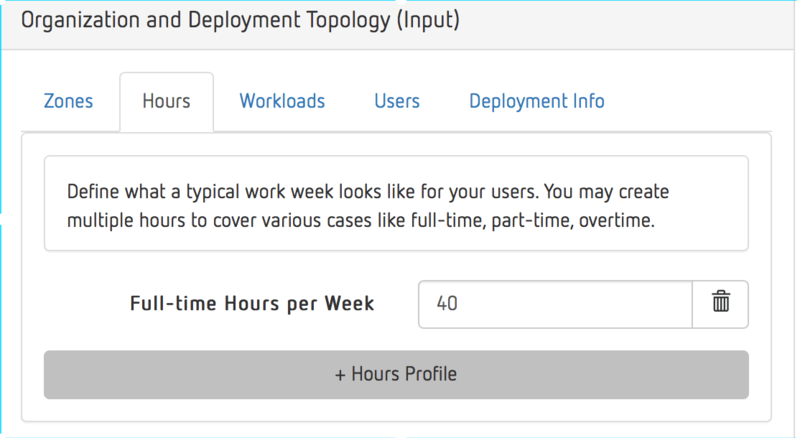 I don’t think we can tell our user to only be able to work for 40 hours a week and I don’t think 5 IOPS will do normally but for a comparison and a first impression this is a good start. I hope you liked it and that it helps you getting some better understanding of the Azure offerings. What do VMware and Citrix bring to market for the Skype for business customer? Is the necessary licensing included (Citrix, Windows, RDS CALs etc.)? Hi Rob, Nice write-up! Only MS licenses you say, does this include RDS licenses as well? Thanks. From what I make of it there are no RDS cals for any of them. Both Azure and Amazon FAQ say you need to purchase them. 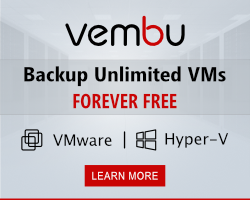 What they offer is pure hardware, compute and 2 licenses to manage the machines. your licensing for users is what is added on top. 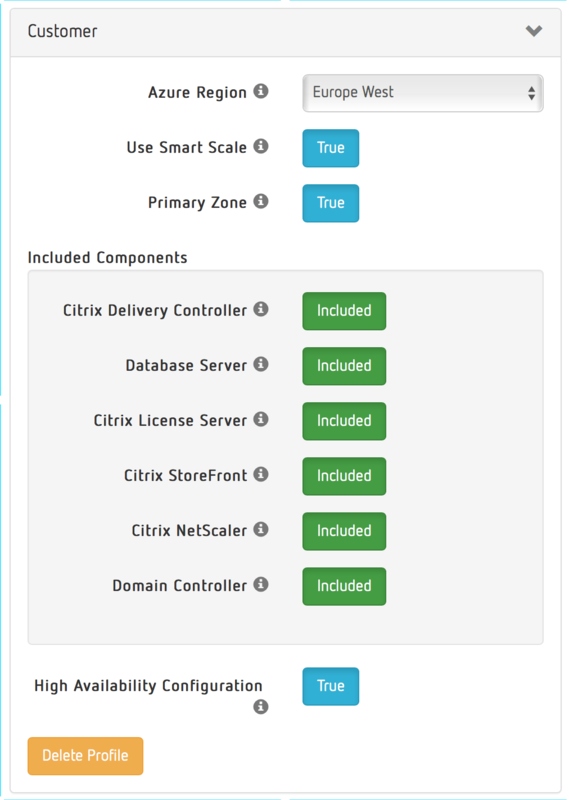 If anyone implemented this setup of using Azure for Citrix cloud can you comment on RDS licensing costs please?